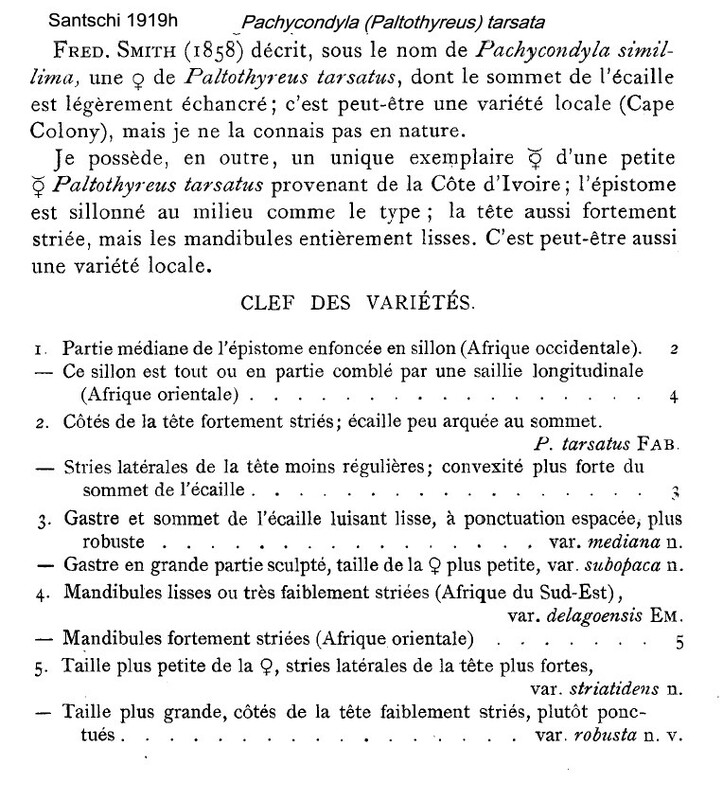 Type location Senegal (Formica tarsata, Fabricius, 1798: 280, worker; Latreille, 1802c: 736, queen; Paltothyreus tarsatus Fabr., Mayr, 1866b: 893, male; in Pachycondyla, Bolton 1995: 310; Paltothyreus revived by Schmidt & Shattuck, 2014: 124) from Gorée Is, Dom. Bosc collection - no images on Antweb (June 2014). pestilentia and spiniventris (Ponera pestilentia (worker, see below) and Ponera spiniventris (male, see below), F. Smith, 1858b: 92, worker & male) from Sierra Leone, collector Rev. D F Morgan. Bernard (1952) remarked on the proliferation of varieties, noting that "with Arnold," he proposed to renounce them all, especially as the so-called differences were all based on the patterns of striation and these changed too much with climate to have any genetic or geographic significance. 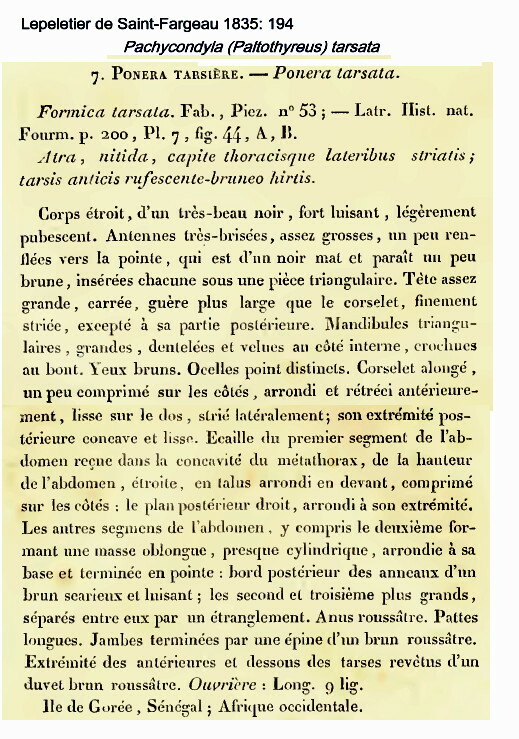 Latreille's (1802c) description is at . Lepeletier de Saint-Fargeau (1835: 194) gave a fuller description, this is at . F Smith (1858b) gave a description, this is at . 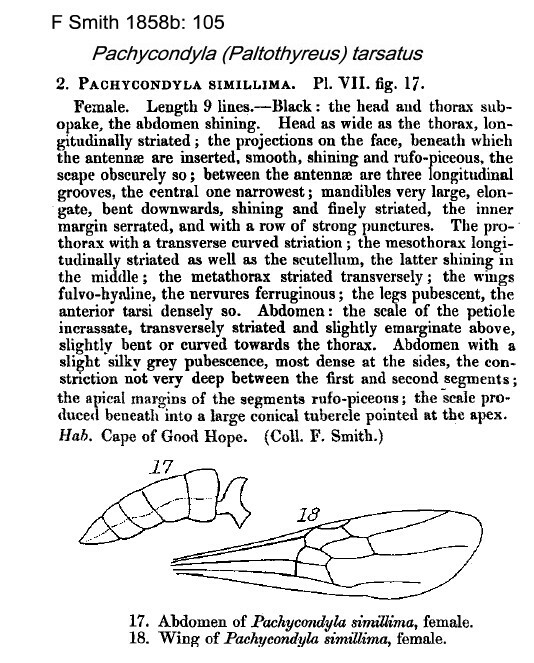 F Smith's (1858b) description of simillima is at . 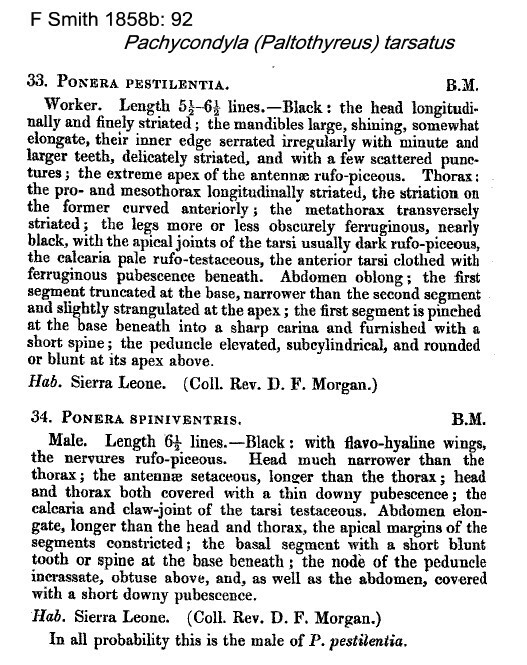 Mayr's (1866b) description of the male is at . Emery's (1899e) description of delagoensis is at . Arnold (1915: 44) gave a description, with delagoensis, these are at . Santschi (1919h) listed and described several varieties - these are at and his notes with a key to the varieties is at . Santschi's (1930a) description of striatus is at . 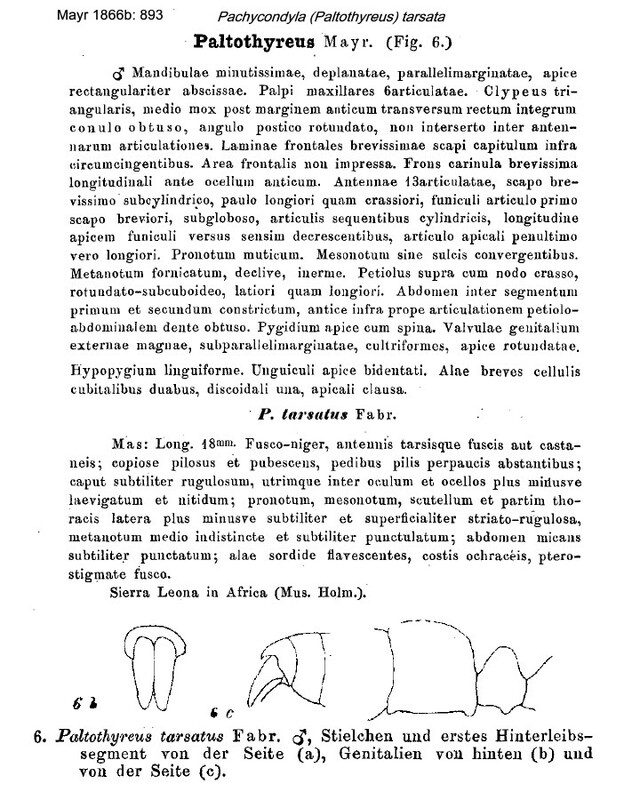 Nigeria specimens (as Paltothyreus tarsatus, Taylor, 1976: 27). WORKER. Monomorphic; TL 18.13 mm, HL 3.75, HW 3.67, SL 3.17, PW 2.66. Colour black, extremities dark red-brown, dull except on terminal segments of the gaster. Relatively coarse striate sculpture on head and alitrunk. Scattered coarse hairs all over and moderate pilosity on the alitrunk. Clypeus with the median portion raised and projecting forwards as a truncated lobe. Mandibles very large and elongated triangular. Claws with a median tooth. Commonly known as the 'Stink Ant', it nests directly into the ground, with the entrance often surrounded by excavated soil and remains of arthropods and other food. Usually forage singly. Among an enormous list of records, Wheeler (1922) had it from Senegal (Dakar, C. Alluaud; Thiès, F. Silvestri; Casamance, Clavaux), Guinea-Bissau (Bissis Island, Lucas), Guinea (Los Islands, C. Alluaud; Conakry, Kakoulima and Kindia, F. Silvestri), Sierra Leone (Samlia Falls, Mocquerys), Ivory Coast (Dimbroko, Le Moult; Jacqueville and Grand Bassam, Lohier; Assinie, C. Alluaud), Ghana (Accra), Togo (Bismarckburg, Conradt, Büttner) and Cameroun (Sjöstedt; F. Silvestri; Mundame, Conradt; Bibundi, Tessmann). He also had mediana from Cameroun (Molundu, Reichensperger). From Nigeria, Lamborn (1915) described how it (as Paltothyreus tarsatus) played a useful role in cocoa by attacking and carrying off termites "on every possible occasion". Bernard (1952) had many records from the Mt. Nimba, Guinea, collections (N'Zo, 480 m, 5 queens, 9 males; Guéguépo, 6 workers, 4 queens, 1 male; Kéoulenta, 530 m, 8 workers, 2 males; Yalanzou, 5 workers, 3 males; Sérengbara, 590 m, 1 worker; Nion, 610 m, 20 workers, 1 queen, 1 male; Thio, 680 m, 2 workers; Camp IV, 1000 m, 10 workers, 2 queens. Lamotte had remarked how it was not found above 1000 m, whereas in southern and eastern Africa it was known from up to 2000 m; doubtless because there the savanna and secondary forest went to such heights. Described (as Paltothyreus tarsatus) as widespread in the Ghana semi-deciduous forest zone, 25 specimens from 7 sites, from leaf litter sampling, by Belshaw & Bolton (1994b); earlier a single worker was collected from cocoa by pkd at Kade by Majer (1975, 1976b) and 9 workers were collected from the ground at CRIG by Bigger (1981a). Lévieux & Diomande (1978) in their description of the activity of Pachycondyla sennaarensis, mention this species as found at Ferkéssédougou in the Ivory Coast Sudan savannah zone. 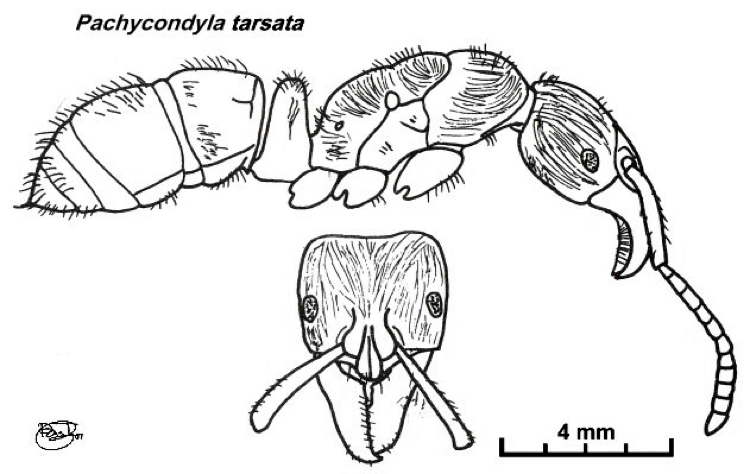 Lévieux (1976a) gave the nest size as 200-1000; Hölldobler (1984) reported extensive studies of communication, foraging on termites, tandem running and nest relocation, also internal anatomy and exocrine glands. Braun et al. (1994) describe studies of nesting in the Ivory Coast. 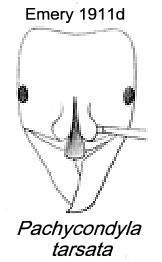 Dejean (1988), Dejean et al. 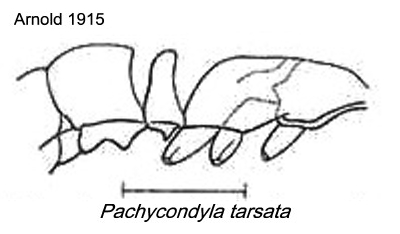 (1993a, as Paltothyreus tarsatus) studied the spatial components of its foraging activities in Zaïre. The photomontage is of a worker collected in Cameroun - south-western tropical coastal forest area between Edéa and Campo (McKey Wolbachia project, Cameroon 15) from location BP (Bipaga - village at 3°07.35' N 10°00.67'; flat land north of the forest road), 24 March 2001; on soil surface attracted to sardine oil bait. The photomontage is of a queen from Ghana, collector S Sky Stephens (06G0001). The photomontage is of a worker from Gabon, Pongara National Park; collector Yves Braet (Gabon 52). 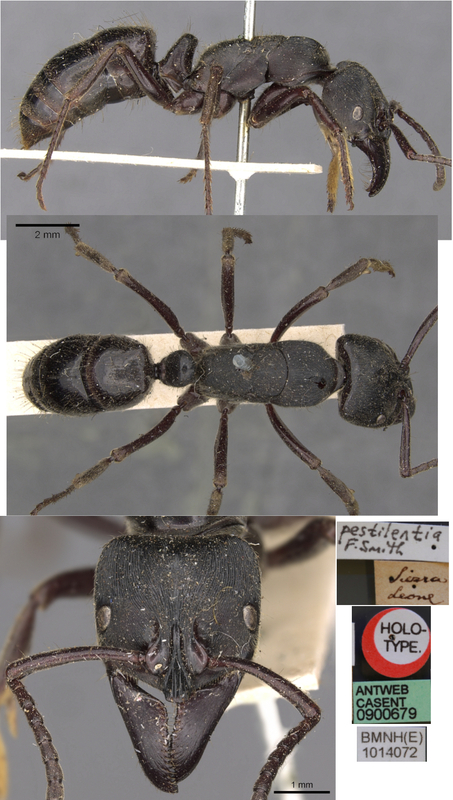 The photomontage of the pestilentia holotype is collated from http://www.antweb.org/specimen.do?name=casent0900679. The photomontage is of an alate queen from the Central African Republic, Dzanga-Sangha NP; collector Philippe Annoyer (CAR JA). The photomontage is of a queen from Ghana; collector S Sky Stephens (06G0004). The photomontage of the spiniventris type male is collated from http://www.antweb.org/specimen.do?name=casent0900681. The photomontage is of a male from , Tai National Park; collector Erena Dupont, iii.2014. The photomontage is of an associated worker from , Tai National Park; collector Erena Dupont, iii.2014.